Photo sent in by © William Marsh. On the 11th September 1952, a Norwegian Whaler cruising off and to the north of Trondhjem, killed a male alienate (a kind of cetacean from the Arctic seas more commonly known as Iroquois) about 65 ft long. 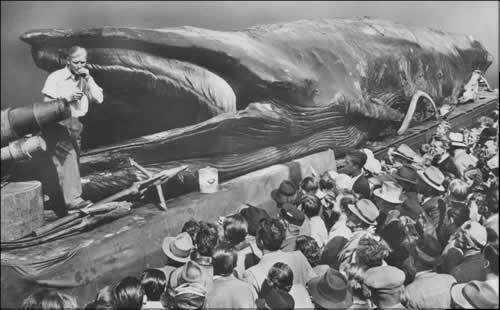 The gigantic animal, whose size corresponded to what was considered as the average for that species, weighed 65 tons and was given the name of 'Jonah'. As a rule, these whales are without delay, turned into oil, blubber meat and bone ash. 'Jonah' wasn't subjected to any of the indignities. Indeed it was destined to a brilliant career as an exhibition piece, being shown at Maidstone Kent. Jonah was preserved by means of an antiseptic fluid, 10 percent formalin and water solution was selected, of which high pressure injections were made in various parts of the body, Jonah absorbing no less than 2,200 gallons of it. The insides were removed with the exception of the air inflated lungs. The big bones of the skeleton, indispensable as supports for the immense carcass were left in position. I saw the whale with my dad. I was 6 years old and the guy in the photo was called Theo. He signed the postcard that we bought at the time and I still have it with all the measurements, weight etc written on the back.